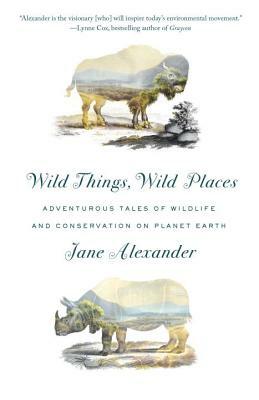 In Wild Things, Wild Places actress, author, and conservationist Jane Alexander offers a moving first-hand assessment of what is being done to help the planet’s most at risk animals. In short reflections on her travels to some of the most remote and forbidding areas, she describes the ways in which human incursions into the natural world are destroying wildlife around the globe. With a clear eye and a keen grasp of the issues, Alexander highlights the remarkable work being done in the fields of science and conservation, and introduces readers to the field biologists, zoologists, environmentalists, and conservationists—the “prophets in the wilderness”—who have committed themselves to this essential effort. Inspiring and enlightening, Wild Things, Wild Places is a deeply personal look at the changing face of wildlife on planet Earth. Jane Alexander is an actress, a writer, and a conservationist. She chaired the National Endowment for the Arts under President Clinton from 1993-1997 and her chronicle of those turbulent years, Command Performance: An Actress in the Theatre of Politics, was named a New York Times Notable Book. A Tony Award winner, Alexander has performed in more than a hundred plays on Broadway and Off-Broadway and was inducted into the Theatre Hall of Fame in 1994. Her long film career includes four Academy Award nominations, for the The Great White Hope, All The President’s Men, Kramer vs. Kramer, and Testament. Appearing in more than forty television movies, she has been honored with two Emmys, for Playing for Time and Warm Springs. A dedicated conservationist and birder, Alexander was a Trustee of the Wildlife Conservation Society, a board member of the American Bird Conservancy, the American Birding Association, and a Commissioner of New York State Parks. She currently sits on the board of the National Audubon Society, the Global Advisory Group of Bird Life International, and the Conservation Council of Panthera. In 2012 the Indianapolis Prize inaugurated the Jane Alexander Global Wildlife Ambassador Award, with Alexander as its first recipient.